← Flat Fitty x SF2 x Kickback Sundays DJ exhibition and cypher ALL STAR weekend! 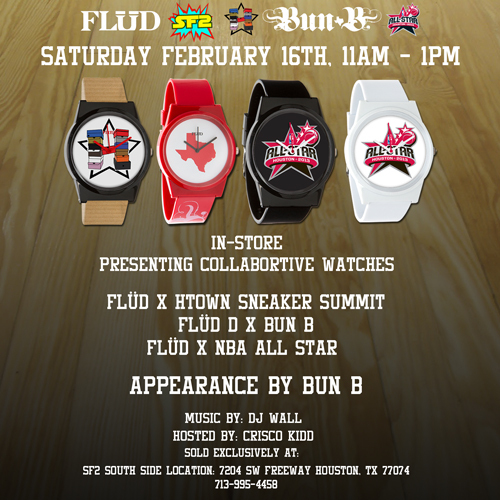 ALL STAR Weekend is approaching and FLUD watches has something special for Houston!! The Official launch of 3 exclusive watch collabs at SF2 South! These will be sold exclusively at SF2. The watches are only $69! For that price, you might want to buy the collection! The first watch is the Official NBA All Star 2013 watch that comes in 2 color ways (black and white). This is a limited edition release and is sure to be a collectors item. The second watch is the Official Bun B TRILL watch that comes is 1 color way (red). This is a limited release as well, and anyone who knows what it means to be “TRILL” will definitely want this piece in their collection. You might even be so fortunate to have the OG himself autograph it since he will be making an appearance. The third watch is the Official H-Town Sneaker Summit watch that comes in 1 color way. Recently rated the #1 sneaker event in the world by Complex Magazine, this is a must have for any sneaker enthusiast. There will be a limited amount of watches for sale this Saturday, Feb 16th EXCLUSIVELY at SF2 South from 11am – 1pm. Come celebrate with us! Early arrival is suggested! This entry was posted in Blog, Events, Fashion. Bookmark the permalink.